Multi-functional dock. 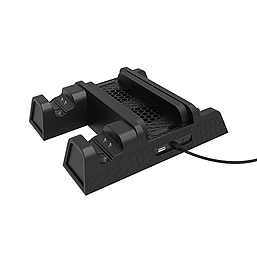 Charging, cooling and storage for your XBOX ONE console, controllers and games. Keeps your XBOX One, One S, One X or Elite console cool - no more overheating concerns. Simultaneously charge two XBOX controllers. Vertical stand provides lots of space, giving you more room to play. Rubber pads on the base prevents the dock from scratching or sliding. Storage slots to keep your games tidy.